Patrick is a former volleyball player at IPFW. In 1992, he played for Team Barcelona in Barcelona, Spain. He teaches Spanish 4 and 3-Honors at PVHS. Before teaching at Palos Verdes High School, Patrick taught at Crane High School in Chicago, Illinois. While there, he started a boys volleyball program and in 1999 the team won the division and city championship. In 2001, Patrick was awarded a Fulbright Scholarship. He served his tenure in Celaya, Mexico, where he taught English at the University of Celaya. He also has a Masters degree in Curriculum and Instruction. 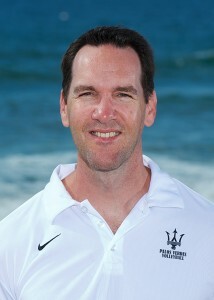 In addition, Patrick is the head coach of the boys volleyball program at PVHS. During that time, the boys volleyball team has been a nationally ranked program, producing numerous players that have gone on to play Division I NCAA volleyball, 2 AVCA High School All Americans, 2004 league champions, and 6 tournament championships. Patrick and his wife Beth have two girls, Lily age 8 and Ryan Marie age 3. Patrick is committed to building a legacy of Sea King volleyball that the Palos Verdes community can be proud of.